Lake Naivasha and the Eldoret Discovery Tour. – Crickey…….we're in Africa! 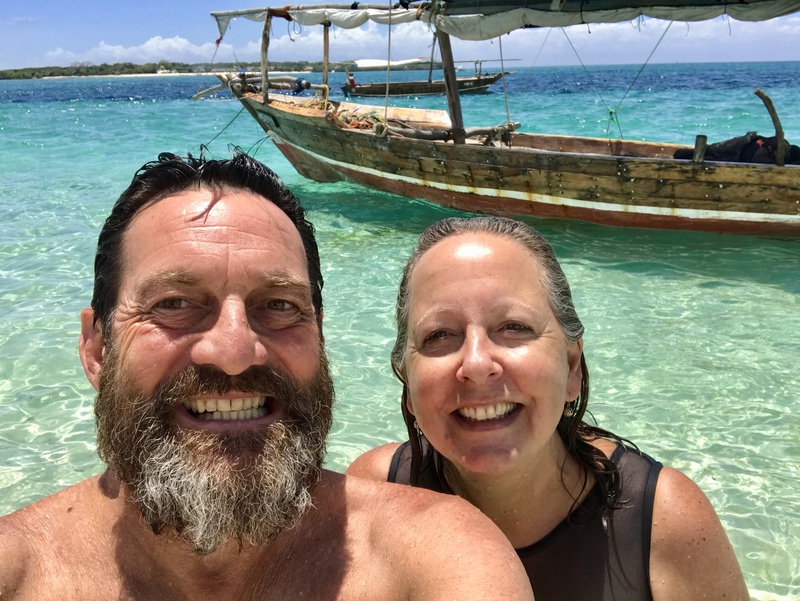 March 23, 2019 March 23, 2019 Marcus and Pauline5 Comments on Lake Naivasha and the Eldoret Discovery Tour. Lake Naivasha and the Eldoret Discovery Tour. So once again we leave the Jungle Junction camp in Nairobi and head west to Lake Naivasha for a few nights. Marcus’s parents Harlan and Hazel farmed up on the Kinangop Plateau nearby so we thought that the lake would be a good base to use while we explored the area. We happened to choose a camp called Camp Carnelley’s due to it being praised on the iOverlander app that we use but wondered if the owners were indeed related to the Carnelley’s that we stayed with in South Africa right back at the start of the trip. It took a couple of days to find out because the owners were not fully hands on and the staff were not sure. Fishermen working on Lake Naivasha. Not a great catch apparently. On a good haul they will bring in 200 fish by taking the net out in a circle and then closing both sides in. Some blokes just love to show off! Anyway on the second day we asked the booking manager and he called Moisey who is the owners daughter, she turned up and took us down to her parents house which is secluded away in a beautiful spot on the property. We were introduced to Tom who indeed is a first cousin of Bridget whom we stayed with in South Africa. Bridget’s parents Lovat and Anne farmed on the Kinangop Plateau very close to my parents and moved down to South Africa. Tom runs this camp with the assistance of his son Lovat and daughter Moisey and they are doing a magnificent ob because it was a lovely peaceful place to stay. We spent one amazing day discovering the Kinangop including a drive around the edge of the Mount Kipipiri Forest Reserve which was full of small scale farms and big pine forests and was just a stunning drive. Huge green houses producing cut flowers for the UK market. On our travels between North Kinangop and South Kinangop we happened to pass the Mucibau Primary school where the children were out playing soccer on the playground but using a tiny ball the size of a tennis ball so we swung around and went into the school where we introduced ourselves to the Headmaster Paul Kamau Karanta and his deputy Anne Gatuyu who were delighted when we asked if we could donate two new soccer balls to their school. They then insisted that we come around and meet all the children in each classroom because they had just finished a subject on interaction the previous week. The children were just so well mannered, also delighted to meet us and had a lot of questions for us including what did we eat in Australia and was it true that Kangaroos have a pouch for their babies! It was a fantastic experience for us and I hope for them too. Paul the headmaster really wants to pursue a sister school relationship with a school in Australia so we will have to see what we can arrange. For those of you reading this blog Marcus turned 60 in January of this year and instead of presents he requested a donation towards a fund to buy soccer balls to give away to schools along the way. Headmaster Paul and Deputy Anne. Really lovely children with really committed teachers. Can you spot Pauline in the photo? Then it was on further north west to the city of Eldoret but we had decided to take a longer but more scenic route than the main Nakuru road and what could have been a four and half hour trip turned into a marathon eight hour drive over some of the roughest roads we had been on. The scenery was amazing and we were given so many friendly waves a shouts of “Jambo” that our arms felt like they would fall off. Some spectacular but rough roads made the day an exciting one! On and on and on it goes! Eldoret has a population 250,000 and famous for producing some of Kenyas finest long distance runners. Most of Kenya’s top long distance runners either come from Eldoret or train here. Eldoret has a population 250,000 and famous for producing some of Kenyas finest long distance runners. It was also the place a good friend of ours Bruce was born in over 60 years ago when the population was only 3000. When we arrived we had a video chat with Bruce to see if he wanted us to take any photos of places he remembered and then we set off to find these locations. Bruce’s father was a dentist in Eldoret but we were unable to find where his clinic was so then we set off looking for the Selby Falls but discovered it was now called the Koromosho Falls and Marcus braved the very steep walk down to and inside the falls while Pauline waited at the top. Koromosho Falls formerly known as the Selby Falls. This was a cool spot on a hot day. We then went looking for the Eldoret Sports Club where Bruce and his brother were given a Fanta and a packet of Biltong in the carpark while his parents enjoyed Gin and Tonics inside the club! Then finally we went in discovery of Bruce’s first school called the Hill Primary School but on arrival we discovered there was security on the front gate and maybe little likelihood of gaining entry. Marcus jumped out of the car and with a big smile and a good story was granted 5 minutes inside the grounds to take some photos. We drove up a long shady tree lined lane to the school and as we passed the football grounds we again saw some children playing soccer on the sports ground with a very old a shabby ball. When we reached the administration block we met the Sports teacher Vidija who was absolutely delighted to accept two soccer balls on behalf of the school and then took us on a guided tour of the school. It was a Sunday but all the boarding students were there and crowded around us wanting to talk to us and high five us which was lovely and quite comical. We could instantly tell that this school had a very special feel about it and the rapport between Vidija and his students was just beautiful. Handing over some more soccer balls. Pauline and Vidija the Sports Master. Maps.me took us on a short cut past the Eldoret tip on the way to the falls! Enjoying your trip. Such wonderful photos of the locals – brilliant smiles from them. Keep up the good travels and stay safe. I am loving your trip- so great to see the places you’re experiencing and to ‘meet’ some of the people. I love African schools- the kids are great and the teachers do an amazing job with little equipment or resources. Have they been singing for you? Yes they love to sing and dance! Things just keep getting better for you guys. Keep on journeying! Previous Back to Nairobi and on to the Masai Mara National Reserve. Next Sipi Falls, Uganda and the best coffee in the World.